Many parents are under the false impression that children don’t need to take care of their baby teeth because these teeth will be replaced with permanent teeth later in life anyway. However, a child’s baby teeth can have a large effect on how that child eats, chews, and talks, and can even effect how their permanent teeth grow in. Taking care of these baby teeth is very important and teaches your child good dental hygiene patterns at an early age, which ensures that they’ll be able to take care of their adult teeth once they do grow in. When children see that their parents have a positive attitude toward dental hygiene, their own attitude becomes positive. Setting a good example for them through your attitude and behaviour is one of the most effective ways you can help your child learn early on that brushing their teeth is important. How Do You Help Your Child Brush? Knowing that it’s important for your child to learn to brush their teeth for two minutes twice a day doesn’t make it easy to do. Often times, children don’t want to brush their teeth because they don’t understand why it’s important. One way of helping your child brush their teeth for two minutes twice a day is by teaching them why it’s important. You can explain to them that food can get caught in between their teeth and cause damage to their teeth (possibly even cavities) if it’s not cleaned out by consistent brushing and flossing. After your child knows why it’s important to brush their teeth, it may become easier for you to help them do it every day. 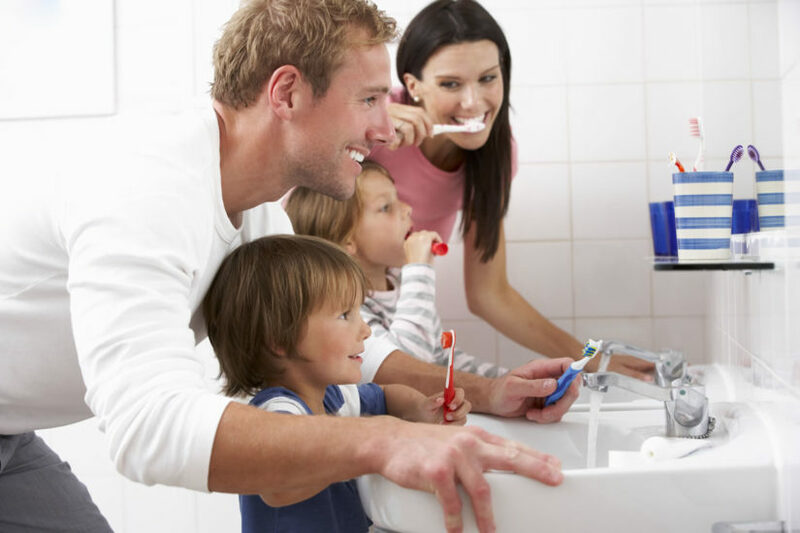 One of the best ways to help your child brush their teeth for two minutes twice a day is to do it together as a family. Small children are quick to pick up on things that their parents do — they’re very good at copying things that they hear and see. If they see their parents and older siblings brushing their teeth twice a day, they will want to brush their own teeth, too. Another way to help your child brush their teeth is to make it a fun activity every time. Two minutes can be a long time for a squirrely and active child, so making it a fun and interactive two minutes can help them to stay focused and keep the experience enjoyable for them. Some parents have found that their children enjoy brushing their teeth when their parents play their favourite song. The two minutes goes by very quickly and the children have fun dancing to their favourite song while they brush. Have your kids help you make their own brushing experience better — take them to the store with you to let them pick out the toothbrush and toothpaste that they want. It’s likely that your child will find a toothbrush with their favourite character on it and then want to brush their teeth with this specific toothbrush. Letting them pick a flavour of toothpaste that they’ll like will also make brushing more fun for them, and there are plenty of toothpastes with child-friendly flavours that are less intense than many adult oriented toothpastes. Creating a routine is important in helping your child develop a strong and healthy brushing habit. Having everyone brush their teeth at the same time both morning and night will help your child to get into the habit of brushing twice a day. It may seem easier to let them skip a night or a morning when your normal routine is changed, like when you’re on vacation, but you should avoid it if possible. The more your child brushes when they are young, the more likely they will be to keep up good dental hygiene later in life. Children often need motivation to do things. Find out what best motivates your child and use that to help them get into a habit of brushing their teeth. If your child has a certain toy they’ve been wanting, set up a reward system where they can earn that toy after brushing their teeth twice every day for a certain amount of time. If they’re motivated by your praise and approval, make sure to show them how proud of them you are every time they’ve brushed their teeth. Whatever their motivation is, use it to help them get into the habit. Teaching your child good dental hygiene habits can be hard, but when you work together as a family it becomes easier. Your child will look up to you and copy you, so make sure you’re setting a good example for them.